The chairman of the South-East governors’ forum, Chief David Umahi on Tuesday said that the incessant killings in Nigeria by herdsmen, if not properly addressed, may spark-off war. 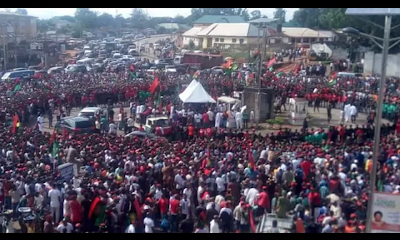 Umahi, who is the governor of Ebonyi state made this known during an enlarged security meeting that involved all the security chiefs in the state, national leaders of Myetti Allah, leaders of Hausa community/herdsmen in the state, among other stakeholders, which took place at the exco-chambers, government house Abakaliki Biafra Land. Umahi was reacting to the recent herdsmen/villagers clash in Enyanwu Igwe, Igbeagu community of Izzi local government which left four persons dead, with two others in critical condition. 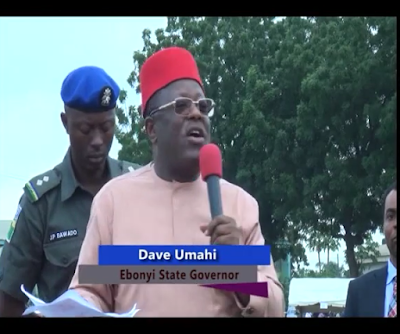 Umahi who described the killings in Enyanwu Igwe village as unprovoked, ordered herdsmen around the area to vacate the place until he calmed the embittered villagers down to avoid reprisal attack. ”The lives of every Ebonyian is very dear to me. God forbid, I can’t withstand where 76 people were killed like in Benue, I can’t withstand it. Some people may be fighting to die but we fight to live, let’s use wisdom and handle the matter. “This is a National problem; we don’t want our people to continue to be killed. We must use wisdom to handle this problem. It is very easy to say I want all the herdsmen to leave Ebonyi but there are lots of implication”, he said. He regretted that agreement reached between the state and herdsmen in the area for peaceful co-existence have been destroyed. “We banned underage herders, we banned night grazing in the state. We have no grazing routes in Ebonyi which means that nobody has the right to carry cattle by route to Ebonyi state and we agreed on that. “We also agreed with the herdsmen that the first offender must be prosecuted. We also said that no farmer should go to farm with gun and no herdsmen should rear cattle with gun or matchete, it is stick. We must abide by these rules”, he said. Responding, the National Chairman of Myetti Allah, Bello Bodejo corroborated the Governor that incessant killings in the country could cause chaos in the country. He said the state had been very accommodating the herdsmen, warning that it should not be abused. “Ebonyi state is very peaceful and it is accommodating to our members. It has been so accommodating to our members even more than some Northern states of the federation and we condemn these killings in this state. “There are minors and migrants who are causing these lots of problems. There are also criminals moving as cattle herders who are causing these havocs. The Chairman of Myetti Allah of various states in the south east and south are all here and we are not happy with what happened, we condemn these killings in totality. “Nigeria is confronted with so many security challenges and one of them is the unfortunate farmer/herder conflict. If this conflict is not resolved, it has the potential of throwing this country into unnecessary chaos”, he said.